Nova Ordo Ater exclusively on black vinyl LP (no CD version). 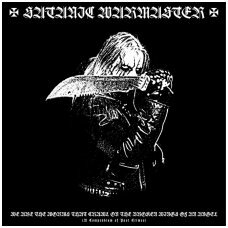 SATANIC WARMASTER needs no introduction nor explanation. Nova Ordo Ater is a raw 'n' righteous rehearsal recorded on 4-track tape on February 28th and March 1st, 2009 in the Satanic Metal Temple. Comprising 38 minutes of stark and stripped-bare black metal, Nova Ordo Ater is an obsidian distillation of SATANIC WARMASTER's live repertoire during this time period. It is being released solely on vinyl format, for only true Satanists, devil worshippers, witches, warriors, and criminals.